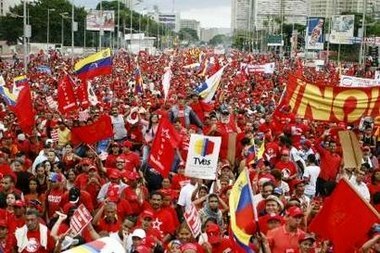 In the middle of our nation’s “great debate” over its immigration policies Venezuela reminds us of two recurring themes in Latin politics: dictators and marching mobs. Not that we should need reminders. Surly mobs march in our streets several times a year now. One of the many joys of multiculturalism. We’ll find out if we have a dictator in about 18 months. We know the pattern. London, Fort Dix, JFK, and each subsequent event will be treated as though it were something “shocking,” new, and unique, because our liberal belief system refuses to recognize the transcendent reality that we have an enemy, that the enemy is among us, and that he is among us due to one cause and one cause only: immigration. There is therefore only one way to end Muslim terrorist attacks in the West, and that is to keep Muslims from entering the West and to initiate a steady out-migration of the Muslims who are here back to their native countries. Sixty-five percent of the Muslim population in the U.S. are immigrants. Once everybody’s a zitizen the media will have a much easier time selling their “home-grown terrorist” whitewash. Just some “random” Americans planning “random” attacks. You have to be a racist who doesn’t want what’s right for the country to think our double plus wonderful open border policies are in any way to blame.